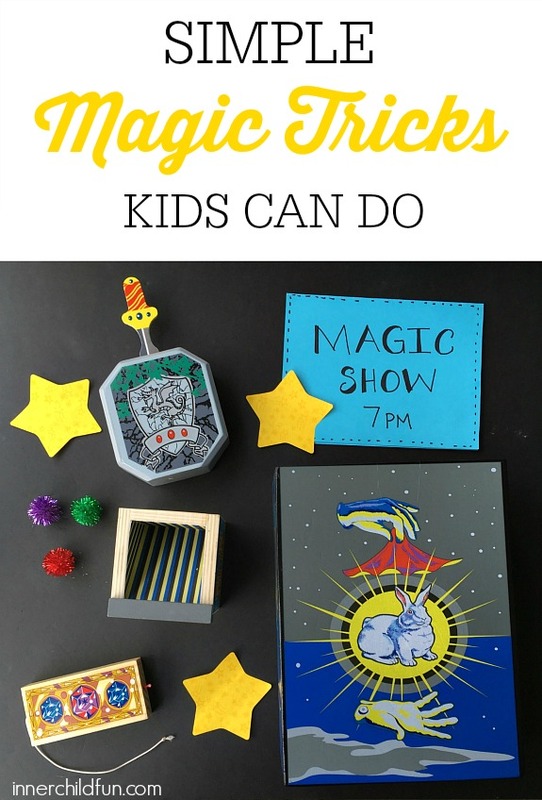 With a little help from the NEW Discovery Magic Set by Melissa & Doug, young magicians can perform several tricks! These tricks are perfect for April Fool’s Day fun, or anytime you want to add a little magic to your day. A big thank you to our friends at Melissa & Doug for sponsoring today’s creative play time post! My 7 year old thought this trick was so much fun! She could remove the sword from the stone, but no one else could. Clever! Secret buttons on the side of the stone make this trick easy for young magicians to do with very little practice. Watch a length of string change colors from red to white and back again right before your very eyes! The color changing string box makes this a super simple trick to perform. Make objects disappear once they go into a magic box! This trick uses a mirror to create the illusion of objects disappearing behind it. When the box is held at eye-level, it is quite convincing! Magician Role Play Costume Set – Everything you need to look like a real magician! Discovery Magic Set – Some tricks featured on this post. Great for kids ages 6 and up. Deluxe Magic Set — Slightly more advanced. My 11 year old enjoyed this set so much! Disclosure: This post is sponsored by Melissa & Doug, and I am a Melissa & Doug Blog Ambassador. All opinions are my own.